HONOLULU - Twinkling waters. Swaying palms. Powdery sand. Sorbet sunsets. Graceful hula dancers. Ahhhhh, Hawaii. Long regarded as a hot spot for destination weddings, it whispers ''exotic'' without requiring a battery of shots or a passport. But over the last year, a perfect storm has soaked the local wedding industry: a shaky national economy, the shutdown of two major airlines servicing the islands, and a statewide crackdown enforcing permits for beach weddings. ''People just aren't coming here,'' said Penei Aller, who runs Beach Weddings Hawaii with her husband, Dard. They were involved with 62 weddings last year - a company record. This year, they've only booked about half that. Aller, a Big Island minister and singer, has been doing weddings since the 1970s. Because her company tends to coordinate smaller events, she thought they'd weather the downturn more easily. The problems started when Aloha Airlines and ATA Airlines abruptly went out of business just days apart in April. The economy was already faltering and worsened as the year progressed. Fuel prices reached all-time highs and reasonably priced airline tickets were increasingly scarce. Morris Atta, who leads the land division for the state agency, said the law is meant to protect the public beaches and originally targeted commercial boating operations in Kauai. 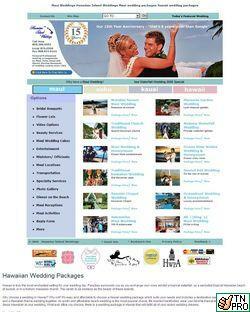 It expanded to include weddings after a Maui party refused to cooperate with officials. The permits are required for most weddings that hire any professional services on the beach, including wedding planners or ministers. Usually, the professionals file for the permits for the wedding couples as proof of liability insurance is required. Violators could face fines of up to $5,000, but Atta said that so far people have been complying and no fines have been issued. Since August, the state has tightened the rules several times. Beach weddings now may last no more than two hours. No chairs may be brought onto the beach except those needed for the elderly and disabled, and fewer decorations are allowed. ''We understand the beaches are public and they are there for the masses to enjoy,'' said O'Donnell, adding that the state made the permit process simpler by putting it online in the last few months. But she thinks some of the new rules are too strict. Wedding-industry professionals are assembling recommendations for state officials that they hope will be an acceptable compromise. The decline in weddings, however, isn't just a wedding issue, noted Marsha Wienert, Hawaii's tourism liaison: Tourism in general is down. The number of air visitors fell 7.9 percent in the first 10 months of 2008 and total visitor days were down 8.1 percent from the same period in 2007. And it's not just Hawaii. ''Tourism around the world is being affected by our (U.S.) economy,'' Wienert said. 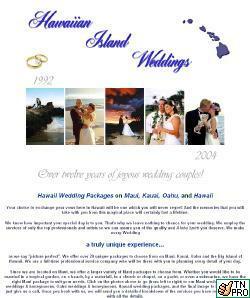 According to the Hawaii Department of Health, 12,377 non-residents were married in the state through September 2008. That's an 11 percent drop from 13,887 for the same period in 2007. Many of those who do come to Hawaii are having smaller weddings and ordering fewer services. Christine Gardner, a hair and makeup artist, said brides are still getting their hair and makeup professionally done, but many are no longer paying for their bridesmaids to join them. ''They're really rethinking what they need,'' said Gardner, who co-owns the salon Flaunt. O'Donnell, who has been in the wedding business since 1990, typically helps coordinate about 80 events annually. She has seen a 30 percent to 40 percent drop over the last year. And Dave Miyamoto, a photographer and president of the Oahu Wedding Association, said his business is down 20 percent from last year. Back then, he said, he was getting bookings at least a year in advance. Now, the calls he receives are more likely to be for a wedding a month or two away. ''People are a little more careful with their money right now,'' he said. I haven't updated this blog lately, as I've been working for weeks updating the website. Now we have a new look for 2009. The last update was last year. Here is the history.. we've come a long way. Besides changing all our home pages for each island, many inside pages have more detail, have been given a face lift, and have been optimized for W3C Html 4.01. 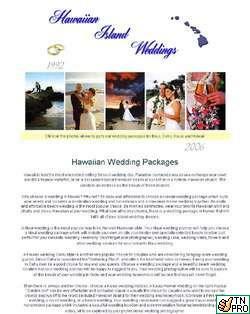 The home page for Maui & Hawaii have links to a pop up slide show of an actual wedding on that island using a video icon placed in the main photo. More information is available in the pop up windows, a "Ask a question. icon has been placed on every page and answers will be given quickly, the Booking form has new mouse over question marks to help you fill out the form more efficiently and give you quick answers when booking your wedding. Typos and incorrect links have been fixed and the site map has been remade to reflect all the page changes. Many old outdated pages and a number of internal use maps have been deleted leaving enough memory to add the second slide show. Look for the home page to have up to 7 different photos which will be changed from time to time.. we get tired of seeing the same thing too.